Do you get annoyed when you receive an email that has nothing to do with your interests? This is the most common reason someone will unsubscribe from your emails. Knowing what your audience wants is vital to keeping them moving along your sales funnel. Here are a few guidelines on how you can get your segmentation up and running. Segmentation is the process of grouping your audience based on their similarities. Demographics: age, gender, income, etc. Company Industry: healthcare, real estate, automotive, etc. After you decide on how you want to group your database of customers, you will need to clean your list. Remove any duplicate email addresses and ones that have “bounced back” previously. This will help declutter your list and you will no longer have contacts with emails that do not exist anymore. Tip: Depending on your type of business, you can use the “bounced” emails as a list of leads for which contacts need updating. You can cold-call a business and use the old contact as a referral to obtain a new one. Type of segmentation — check. Cleaned your list – check. Now that that’s done, you will need to make sure your audience contact information is organized. Contact properties are the key to keeping your segmentation working correctly. Make sure the fields you are using to segment are correct and filled in. Tip: If any of your contacts are missing the property information you need, you can send that list a separate campaign that includes a CTA for some type of offer to obtain the information. Now that your list is ready, you will need to define types of audiences within your segmented groups. This is typically done by using buyer personas and where they stand in the buyer’s journey. 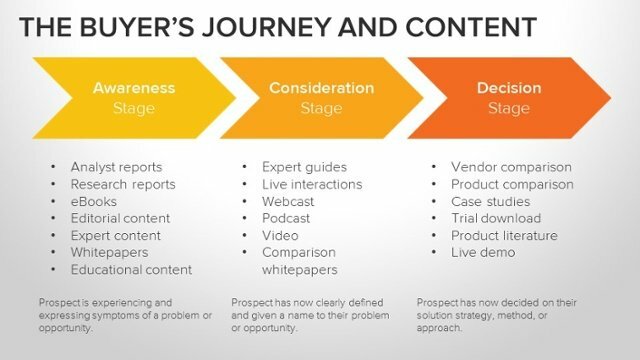 Here is a great graphic from HubSpot that shows types of content for the stage a buyer is in. Having a CRM software can help tremendously with segmentation. It allows you to build workflows based on many types of actions, along with housing all your contacts in a database. Here are a few types of Customer Relationship Management software that offer some form of free membership (depending on membership level).